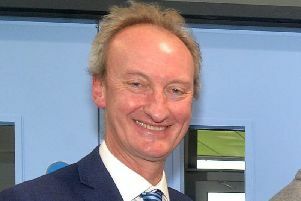 Roger Wilson, Chief Executive, Armagh City, Banbridge and Craigavon Borough Council. The figures were made available by the TaxPayers’ Alliance which this week published its annual ‘Town Hall Rich List’ detailing the top earning council staff throughout the UK. Top earner on the local council was Chief Executive Roger Wilson who was paid a total of £138,650 (including £21,150 pension contribution). He was among the top council earners in Northern Ireland for 2017/18 - Belfast City Council’s chief executive Suzanne Wylie topped the NI salary league earning a total of £162,250 – nearly £30,000 more than the next biggest earner. Other top earners were Newry, Mourne and Down chief executive Liam Hannaway on £138,950 and Antrim and Newtownabbey chief executive Jacqui Dixon on £134,250. The only NI council whose chief executive did not appear on the list as earning over £100,000 in 2017/18 was Lisburn and Castlereagh, whose former chief executive Theresa Donaldson announced in May 2018 she was to resign. She was replaced in November by David Burns. Dr Donaldson was a former chief executive on the old Craigavon Council. At non chief executive level three other ABC employees earned in excess of £100,000. Director of People Mike Reardon earned a total of £120,950 (including £18,450 pension benefit). He was followed by Sharon O’Gorman, Director of Position, who was paid £103,250 (£18,750 pension benefit). Also receiving £103,250 was Olga Muragh, Director of Place.